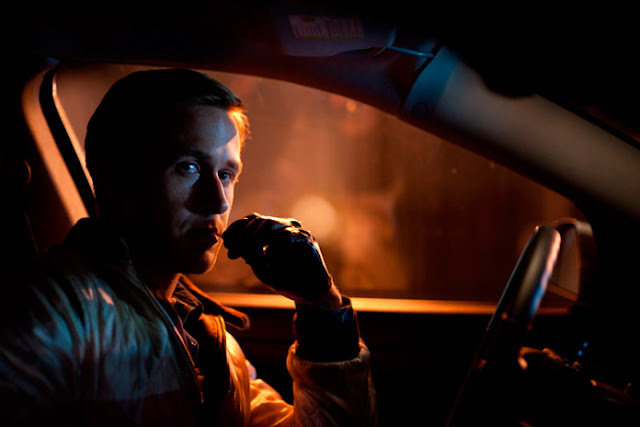 Drive, Nicholas Winding Refn’s minimalist action movie about a stunt driver (Ryan Gosling) who moonlights as a getaway driver, feels like a film out of time. Its methodical pacing, neon-soaked vision of L.A. and electronic soundtrack give it the feel of a lost Michael Mann film and it’s easy to see why the film received such a mixed response from audiences on its theatrical release. Anyone expecting Fast Five would be sorely disappointed by its lack of traditional spectacle in favour of a slow, chaste love affair between Driver and his neighbour, Irene (Carey Mulligan), broken up by scenes of startlingly brutal violence. Gosling is Driver. He has no name, just an occupation. He has no past, just a present. He arrives fully formed as an iconic figure, a man who is intimately aware of how he looks and how he acts. As a stunt driver, he acts out scenes that have the appearance of physical danger with a tremendous safety net, giving him a sense of tremendous serenity even as he flips a car over. That same cool, collected demeanour is also on full display in his nocturnal dealings with L.A.'s criminal underworld, which he conducts like a character from a film; he meets his clients, once if at all, lays out his strict rules then conducts himself with a level of detached professionalism that is unnerving. That he also performs all his business in a white satin jacket emblazoned with the image of a scorpion on the back, one that he wears no matter how dirty or bloody it gets, speaks volumes about how Driver sees himself. He is a man trying to live up to the legend he has created from watching too many films and reading too many romantic stories about criminals with hearts of gold. Driver's detachment starts to slip when he meets Irene. He falls for her instantly, and in the long, lingering looks that Gosling and Mulligan share over the course of the film it is clear that she has strong feelings for him, too. However, she is married to another man, one who is admittedly in prison, and their relationship remains one of unrealised passion for much of the film. Though Driiver is being kept busy by other things. Shannon (Bryan Cranston), Driver's friend and employer in all his guises - stunt driver, mechanic and wheelman - is trying to convince Bernie Rose, a businessman of ill-repute played by Albert Brooks, to invest in a stock car so that he, Shannon and Driver can make some serious money from Driver's skills. Everything seems to be progressing smoothly until Irene's husband, Standard (Oscar Isaac) returns from prisoner, complete with unpaid debts in tow. Driver finds himself inexorably being drawn into a situation where he will have to help Standard in order to protect Irene, at which point everyone's plans and dreams get disrupted and destroyed. Much like Driver, Drive is a film concerned with image, specifically its own, and every shot in the film is framed in a way which feels iconic and timeless even when watched for the first time. Every character in the film conforms to a well-established cinematic archetype - the Man With No Name, the pure innocent, the gangster, the kindly but flawed mentor - which indicates that whilst the film may look and sound like a film from the 1980s, its story is actually grounded in tales that have been a staple of cinema for far longer. The idea of a man without a past entering the lives of ordinary people in order to help them is reminiscent of a thousand Westerns, though the film specifically recalls Shane, and Refn’s decision to use images of cars and action movies hearkens back to films like The Good, The Bad and The Ugly, which took American iconography and used it to explore deeper, more existential themes. Here, Refn explores the meaning of heroism and what it really means to commit to helping people. In order to do what is right, Driver must commit acts of heinous, gut-wrenching violence, and there is a strong ambiguity in the film over how we are meant to perceive his actions. Is he a hero, or a sociopath? Are the two even mutually exclusive? Despite this, Refn is very much a genre director, so whilst he explores the nature of heroism fairy tales, he never forgets to make an entertaining, sharp thriller. The slowly winding tension of watching Driver get involved in Irene's life, realising what he must do to help her, then realising just how much evil he will have to commit if he is going to do the right thing, is masterfully handled. It builds to a fever pitch before quite literally exploding halfway through, after which the tone changes from one of brooding, inescapable menace to one of manic intensity. The final half an hour or so, in which Driver finally transforms into the sort of hero that he only pretends to be in his day job, is relentless in its sense of unfolding disaster, as all the various players are drawn into conflict and blood flows freely. It’s also in the last part of the film that Albert Brooks truly shines as Bernie is reluctantly drawn into the mess surrounding Driver, Irene and Bernie’s partner, Nino (Ron Perlman). There’s something monstrous yet deeply human about Bernie. He’s a man who didn’t ask to be involved and isn’t happy about the things that he has to do, but once he is forced into action he does them with a ruthless efficiency that belies his affable demeanour. It’s a great performance, and Brooks’ recent Oscar snub will be remembered down the years as one of the great Academy injustices, as will the lack of recognition for the film itself, which is a truly astonishing, compelling piece of work. Drive is one of those rare films in which every element seems so completely in-sync with each other that the whole thing winds up being almost too perfect. The beauty of Refn's imagery, the uniformly great performances and the astonishing soundtrack, a mixture of synth-pop tracks and Cliff Martinez's menacing score, all combine wonderfully to create a work that fits together like the piece of an exceptional machine. As a result, the film feels a little clinical. Then again, it isn't meant to be emotionally involving, so much as a fun ride, which it most definitely is.